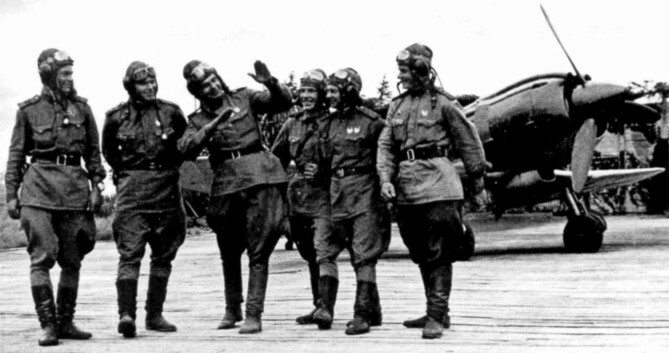 During the war at the east, the Russian pilots gained more experience and their planes became the excellent ones. Our planes have become heavier and heavier, but the Russians chose another way and built the planes with better climb and maneuverability. The Russians indeed created the planes with the great aerodynamics. Oath: a fighter unit receives Guards' status. ADD was created by decree of the GKO (State Defence Committee) on 5 March 1942. It was officially dissolved on 6 December 1944 when it was incorporated into the VVS as the 18th Air Army. 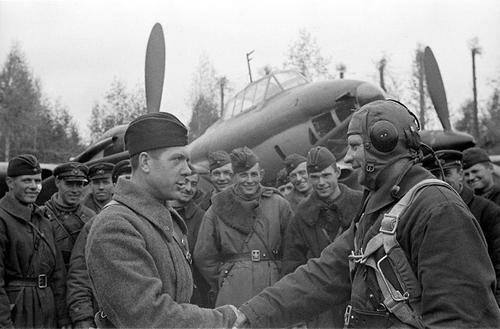 On 6th June 1943, Soviet pilot of 88IAP Alexander K. Gorovetz attacked a big group of the Stukas. His alone La-5 shot down 9 (nine!) Ju87s in single combat and forced all other bombers to chaotically drop bombs and to retreat. Unfortunately, he was out of ammo. And when four FW190s arrived, the hero was killed. So 9:1 during one mission is the world best score for a single fighter. These results were confirmed by ground troops which watched this bloody battle in the sky. 260-th SAD. 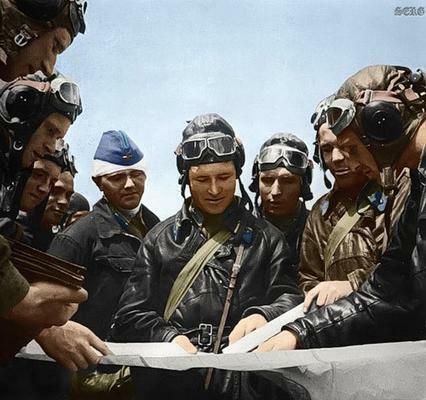 Russian fighter pilots after an aerial combat. During world war II, different countries used different score systems and victory criteria for arieal kills count. So results comparison of different nations pilots isn't simple task. Also, it was hard for the Soviet pilots to confirm theirs claims. Before 1943, planes downed to enemy territory weren't count. USA and Great Britain. The mathematic principle. A kill divides by a number of pilots, and each pilot gets a part of a kill (0.25 , 0.33 , 0.5 and so on). And, of course, no-fractional figures are for individual kills. France. Any kill (individual or shared) counts as individual. Also, it was easy for a pilot to confirm any his claim. Many probable kills counted as sure kills. Romania used "greed" principle. From 1944, pilots were awarded 3 victories for downing a 4 or 6 engined aircraft, 2 victories for downing a 2 or 3 engined aircraft, and 1 victory for downing a single engined aircraft. Example: Cantacuzino has 56 confirmed kills, but this actually represents a total of 43 planes shot down. Japan units used no individual scores. So most of info is taken from pilots' personal diaries and logs. That's unreliable and exaggerated. Germany - the most classic case. "One pilot - one victory" principle declared. However, occasions are known, when the German pilots claimed number of victories, much bigger than actual Soviet losses and even bibber than number of Soviet planes engaged. 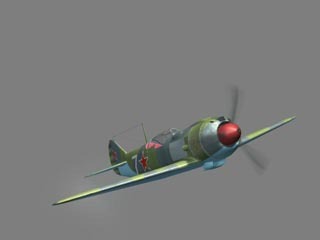 Example: On 4th July 1943, 7 Soviet planes (2 Hampden, 3 DB-3F of 9GMTAP and 2 Il-2 Shturmovik) attacked a German ships. They were intercepted by 6 Bf109 leaded by commander of 7/JG5 Theodor Weissenberger. One Il-2 was shot down, and one Il-2, two Hampdens and one DB-3F had to ditch at a return route because of the combat damages. Only two torpedo bombers managed to land to a airdrome. German pilots claimed 16 (sixteen!) "victories", including 7 "kills" by Weissenberger. Oh yes, the German pilots were the knights of the knights! They shot to an enemy pilots which had to bail out (the habbit from Spanish Civil War times). And they shot to a helpless civilian columns which tried to escape the invasion. Medical trucks and trains were the excellent targets for Luftwaffe pilots: it so was easy to aim the big red cross. USSR had not especial army recons, only recon modifications of linear warplanes. 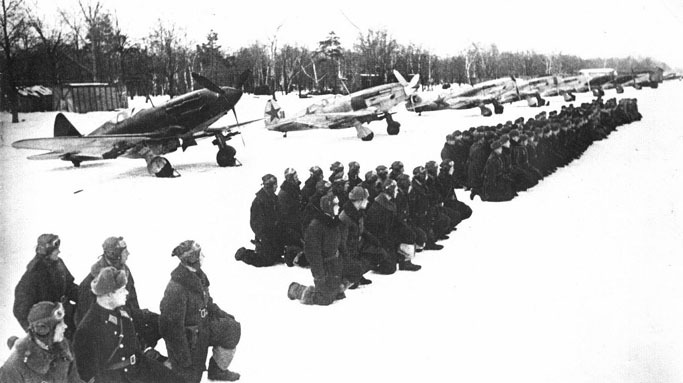 The "R" char is for "разведка" (Razvedka = recon) Pe-2R and Pe-3R, Yak-9R, Il-2R, also few lend-leased O52 Owl. Navy recon hydroplanes and flying boats: MBR-2, KOR, MDR-6, lend-leased Catalina.